I want to share some memories about the times, when breaking news on radio at 8am were not about another crisis, but about the result of chess game between Korchnoi and Karpov. Chess was largely popular, people played at home, in the clubs and parks, at work – I remember playing blitz at lunch time ( sometimes my usual opponent and I secretly ate earlier and played the whole hour). When I began to work after university, I got into a big institute, where there were more than 20 rated chess players. A few times the management invited leading GMs to visit us. I became acquainted with one young chess player, who told me an amazing story how just a few months before I came, Mikhail Tal was there. My friend was lucky to play in simul. Tal was smoking and moving pretty fast making his moves. The guy was able to hold his own for quite some time, then what happened was something like at a war’s front-line, when everything is very quiet and you raise your head just a bit from the trench to check what’s going on. At that moment a sniper hits you in the head. He made one non-cautious move. Tal came, spent a fraction of a second to sacrifice a piece and went further. After a few moves my friend realized that Tal queens ahead of him and the game was over. Another time, I was present when GM Mark Taimanov was invited. He was a super-elite player and a world class piano performer. He was asked about Fisher (it was already after Fisher forfeited his match with Karpov). To my big surprise, despite losing to Fisher 0:6 in the Candidate match and negative hype in the Soviet mass media, he found only good words about him. He said, Fisher is a great player and all GMs are obliged to him for attracting a lot of attention to chess and raising it’s prestige. Thanks to Fisher, he said, prize funds rose essentially and at least the best players can make a decent living. Explaining why he thinks Fisher didn’t play with Karpov, he said that Fisher was a person to whom chess was the highest intellectual activity possible; he divided all the people into 2 categories – playing or not-playing chess. When he won the chess World Championship, it put a huge responsibility on his shoulders – to be a number one in this number one thing. So when that “dark horse” Karpov appeared, defeating all the candidates, maybe Fisher wasn’t sure that he would be able to play as well as he has to (he didn’t play after 1972). Taimanov’s opinion was that Fisher actually didn’t want to play, so he made non-realistic demands. Are you afraid of the Marshall attack? Ruy Lopez, Marshall attack, are you afraid of it? I actually am ( to play it for White ), and not just me, but quite a few GMs – Gary Kasparov (OK, I respect him too much – he just didn’t want to play it), Kramnik, etc. played/play anti-Marshall lines to avoid it, why? 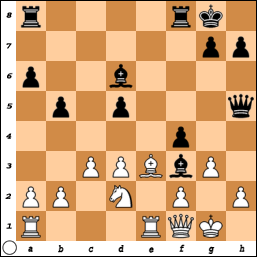 Kramnik vs. Leko, 2004, World Chess Championship. Leko as Black played Marshall attack 4 times, 3 times Kramnik avoided it, drew, 4th time accepted, played a novelty – Leko found a hole in it and won. GMs Adams and Nunn like to play it as Black, the result? Adams – 29 games – 8 wins, 4 losses, 17 draws, Nunn – 27 games – 7 wins, 3 losses, 17 draws. So, what is it, how it appeared? Frank Marshall first introduced it again Capablanca in 1918. After 15. 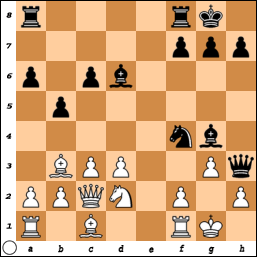 …Bg4 white plays 16. 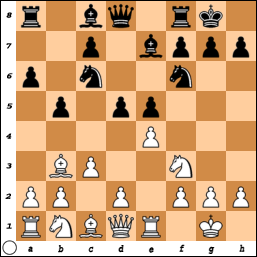 Qc2, this allows combination ( now I understand why white in many variations exchange bishop on b3 for night on d5) 16. … Nf4! 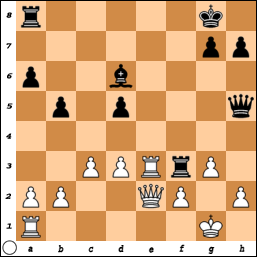 White resigned ( 17. exf4 – forced … Bxf4 18. 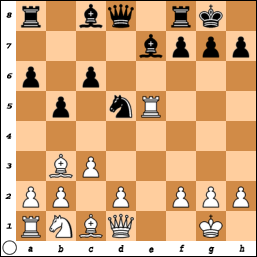 Nf3 Bxf3 with mate on g2). Just this Sunday I played my first Marshall attack in the rated tournament. It was last round, I needed to win, so I decided this is a time. After 12. d3 Bd6 13. Re1 Qh4 14. g3 Qh3 15. Qf3 Bg4 16. Qg2 Qh5 17. Bxd5 cxd5 18. Be3 Bf3 19. Qf1 f5 20. Nd2 BIack played 20. … f4! 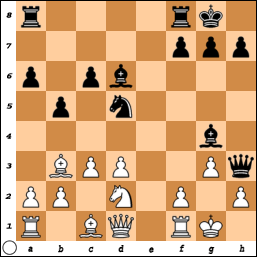 White can’t take the pawn ( 21. 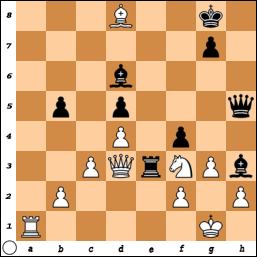 Bxf4 Rxf4 22. gxf4 Qg4+ or 21. gxf4 Qg4+) because of the mate on g2, so he decides to take the bishop – 21. Nxf3 fxe3 22. Rxe3 Rxf3 23. Qe2! 23. … Raf8? ( … Rf5! ) 24. Rxf3 Qxf3 25. Qe6+ Qf7 26. Qxd6 Qxf2+ and game finally ended in a draw. Of course, Marshall attack is not a recipe for guaranteed win, there are many good defenses for White, so you take risks, but if you want to get an attack with Black pieces just after first 15-18 moves, where for your opponent every move is like a step on the minefield ( step aside of the safe path and you are blown up – see above ) you would definitely try it.